Note: Article first written 1st Aug 2016, fully updated 19th Dec 2016. 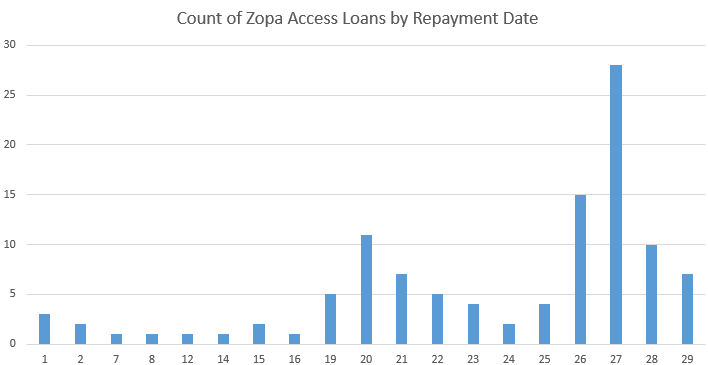 Zopa is the oldest and largest P2P lender in the UK. This established track record and the massive size of its loan-book means it’s generally regarded as one of the safer P2P platforms. In March 2016 they restructured their investment products into three accounts: Access, Classic and Plus. These offer either easier access to sell out, or longer term investments with and without a safety fund. In November 2016 they applied for a full banking licence, which if granted would let them offer products like overdrafts and cash deposit accounts. This is unlikely to happen before 2018 however. Also in the pipeline is the Innovative Finance ISA. So, with Zopa we have a large, established platform that is more likely to target a mainstream consumer investor looking for a trusted brand. Zopa Classic will give customers the security of Safeguard and access to their money at any time, subject to a 1% fee. This product is most similar to what our lenders have today, however what’s new is that it combines 1 – 5 year loan terms. 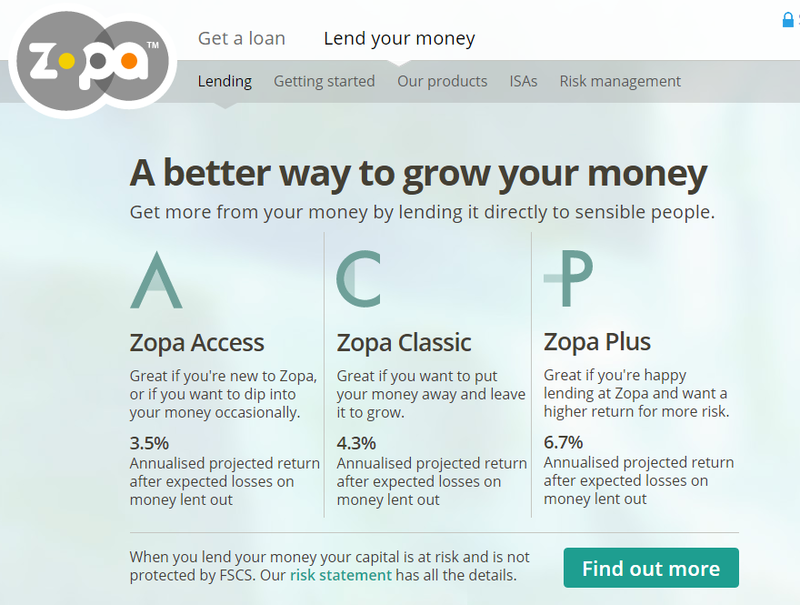 To clarify as I understand it, the Zopa Plus product takes your £1000 minimum investment and invests in at least 100 different loans (1% minimum). Some of these are at a higher risk (D and E rated). You have the ability to access your loan book from within your Zopa account, and with the Zopa Plus account you may have an average interest rate of 10-14%. They project that after defaults you should have a 6.7% return, and force you to initially invest at least £1000 to ensure you have a wide enough diversification. Overall, it’s a very simple platform to use that also has detailed access to your underlying loan book. The new customer cashback was really easy too – the day after my £2000 was fully loaned out they credited my account with another £50. Full terms and conditions along with a working referral link can be found here. When you click on the ‘selling your loans in our FAQs’ it takes you here. I had naïvely thought of the access account a bit like a slow withdrawal bank account, where I could withdraw the savings whenever I wanted. Now it appeared as if it was not that easy. 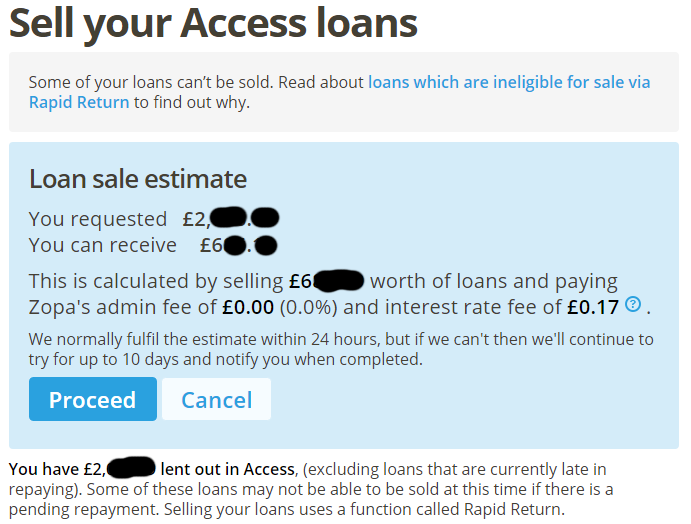 Why Can’t I Sell Zopa My Zopa Access Loans? It’s clear that the delay is due to repayment dates. 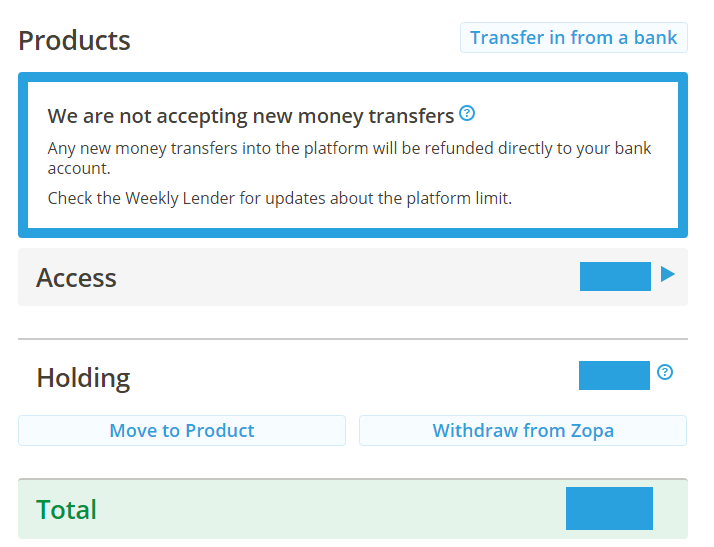 I’ll update this post in a few days to confirm, but it appears that the Zopa Access account is pretty easy to withdraw money, unless the loans are repaying. You’ll have to log in a week later to sell the remaining chunk of your loans. Update 1 week later: The difficulties in selling out were indeed due to the repayment dates. I waited a few days and had the ability to sell everything. One nice bonus was that when I sold some of my loans, my interest rate actually went up to 3.8% due to the random selection of what was sold! Throughout December, we will monitor the levels of new money. When necessary, we’ll stop all inbound transfers while we disburse the new funds already in the queue. Currently, the time to lend new money is projected to be slow, so we are not accepting new money transfers. You can check your Weekly Update email and live tracker in My Zopa for the latest information. Zopa have said they will review this on a week-by-week basis. If they are taking deposits, you’ll see something along the lines of ‘We currently have a platform limit of £1,400,000’ (this is what it said when I checked on December 19th). Zopa is a well established platform that appears to be targeting the mass market with its simple hands off approach. For me, it would help if they explain in more detail with visual examples why people may have a delay selling out of their loans. I imagine that many first time P2P lenders will use the access account without thinking that they may have to wait a week to withdraw all of it. Then, come some emergency where they need to withdraw, it may be frustrating to be prevented from doing so with no well defined explanation. With Zopa Plus you are automatically spreading your risk in a wide basket of higher risk loans and getting a return closer to higher risk platforms. Once they finalise the Innovative Finance ISA, then Zopa Plus will potentially offer an attractive balance between risk, return and hands off automated investment. You are an active investor in Zopa or have been in the last 6 months. It may therefore be worth waiting until the day after your peak repayments before initiating the sale (the start of the month in your case above).